This Friday, November 9, 2018: Get ready for an exciting opportunity to start/add to your collection or finish your holiday shopping early! Choose from over 130 original artworks up to 10 x 10″ all priced at ONLY $88. All works will be sold ANONYMOUSLY. Whose work will you be on the lookout for?! Come early and claim your favorite piece. It is a DASH after all! Music by DJ Joan Holliday of WRSI. Light Refreshments. Disco ball. This event is FREE and open to the public. The RED DOT DASH is supported in part by a grant from the Massachusetts Cultural Council and the Northampton Arts Council. Since 2009, The ArtSalon has introduced to the public some of the area’s most vibrant artists. These selected artists present their work in a Japanese style called PechaKucha (pronounced peh-chak-cha) for six minutes; twenty slides for twenty seconds each. The ArtSalon wants to provide an honorarium for these artists for their time and effort. 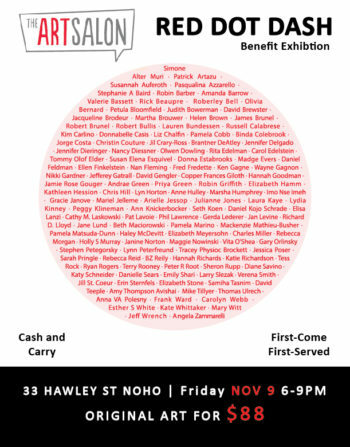 To fund this endeavor The ArtSalon will host its First Annual RED DOT DASH Benefit Exhibition at the new 33 Hawley Street, Northampton Community Arts Trust Building on Friday, November 9, 2018 at 6-9 pm. 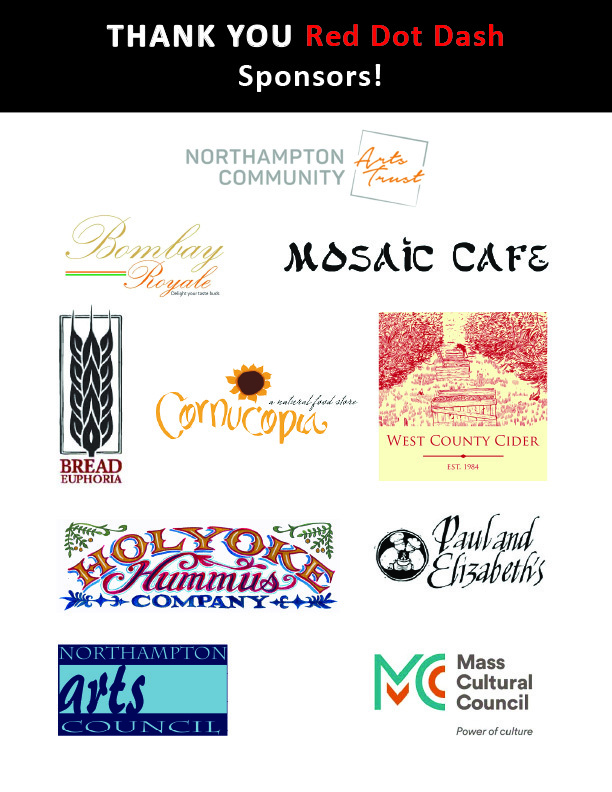 It will coincide with the November Arts Night Out, Northampton. Come to our exhibition/party after checking out the gallery openings! Please apply here. Submission deadline is November 4, 2018. Download the Red Dot Dash Forms, print and submit with your artwork. DROP OFF/MAIL WORK to A.P.E. Gallery, 126 Main Street, Northampton, MA 01060. All work must be delivered/received by November 4. 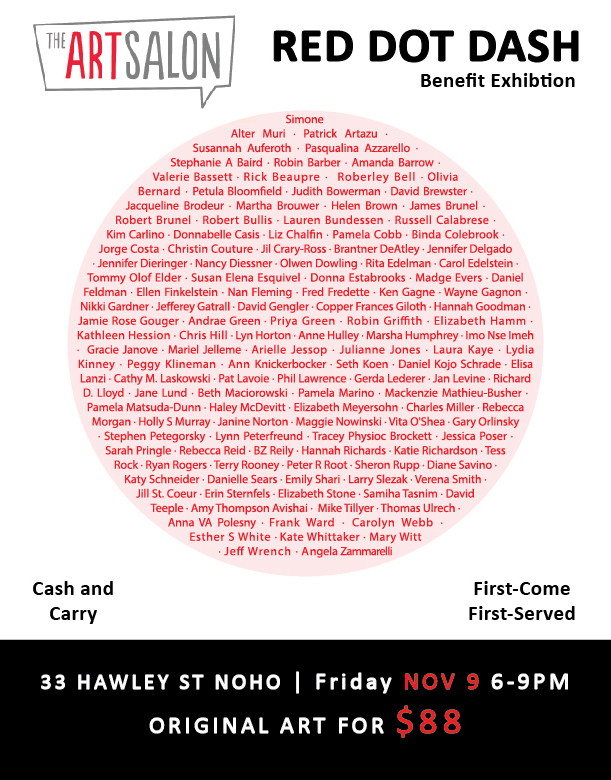 Hand-delivered work will be accepted at the gallery ONLY on Nov 3-4, 12-5 pm. Any and all artists over 18 years old are encouraged to submit ONE original work up to 10”x10” (it does not have to be square). Artwork can be in any medium ON PAPER, CANVAS OR BOARD, including drawings, photographs, paintings, printmaking and mixed media, as long as it is a maximum of 10”x 10″ inches, UNFRAMED with no mat. Please indicate TOP with an arrow. All work will be displayed ANONYMOUSLY, however PLEASE SIGN and PRINT NAME on THE BACK ONLY. Flat pieces will be hung with binder clips at the top corners. An archival paper tab will be placed between the artwork and the binder for protection. Works on stretched canvas or board will be displayed on a shelf. The exhibition and sale is not juried. All work that arrives by the deadline and meets the submission criteria will be displayed. 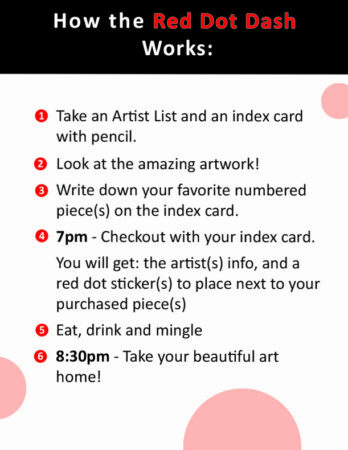 All participating artists will be listed in exhibition materials. Artists will be contacted via email 4-6 weeks after the event regarding sales and collector information. UNSOLD hand-delivered artwork must be picked at the A.P.E. Gallery ONLY on Saturday, November 17, 2018, hours 12-5 PM. If you would like your UNSOLD artwork to be returned by mail, please enclose a self-addressed stamped envelope/container with your piece.